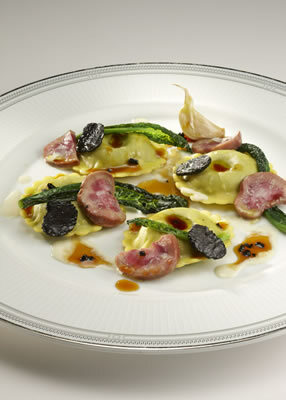 After my recent dinner at Il Palagio, I am convinced that it is one of the best restaurants in Italy. 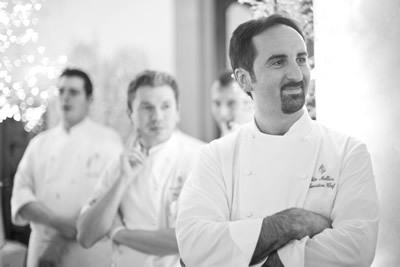 Vito Mollica (pictured) is a magnificent chef and a charming man. He has one Michelin star, but it must surely be joined by a second before too long. His cuisine is refined, exquisitely judged and precisely executed and yields immense pleasure to those fortunate enough to dine at his tables. 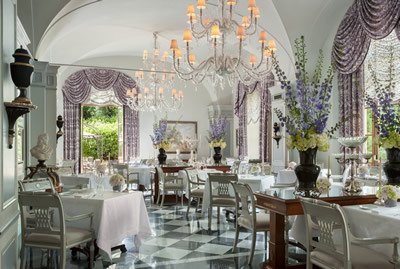 Those tables are housed within the Four Seasons Hotel in Florence, a place of frescoes, stucco, carved stone, gilt, crystal and sumptuous fabrics. It is, of course, a converted convent. (This is Florence, after all.) But the atmosphere, while exceedingly proper, is relaxed rather than reverential. Still, I must concede that the setting is nearly as impressive as the food. Three huge crystal chandeliers, each with 26 lights, hang overhead; beneath one’s feet is polished marble; the napery is of the finest white damask; the glassware is by Spiegelau and the crockery is by Bernardau; upon each table burns a single tapered candle in a silver stick; and the waiters, smart in their grey waistcoats, are careful to refold the napkins of those who leave the table for a moment. Although a six course tasting menu was available (125€), I chose instead four courses from the carte (for which you should expect to spend 120€-140€). I very rarely (very rarely) rate dishes in my highest category of ‘superb’, but here not one but two of my four courses easily won that accolade. That is why I was so impressed. But, before them, I had to be content with food that was merely very, very good. First, there were leeks, filled with parmentier cream, morel mushrooms and fontina cheese fondue. This was as light, as delicate and as delicious as I could have wished. Then, as a complete contrast, came pici pasta – made in-house, of course – with guinea fowl ragout and pecorino cheese. This was rich and satisfying and filling. But not too filling, thank goodness, for I had to have room for my main course – the first of the culinary masterpieces. Chateaubriand is a longstanding favourite, and I have enjoyed it many times and in many of the world’s great dining rooms. But this was certainly one of the very finest I have eaten. Its tenderness, its favour and its succulence were exceptional, and the seared foie gras and the gratinated bone marrow, with which it was served, raised the whole to the realm of the sublime. It was carved by the table, of course, and came with mashed potatoes, the customary Béarnaise sauce and … peas. I am one of humanity’s great lovers of peas, and I was delighted to discover that Mr Mollica shares my passion. So these peas were beautifully fresh, gently steamed and absolutely delicious. This, then, would be the gastronomic pinnacle of my meal. But no. To my amazement, the pudding was just as good. This was the miracle of ‘Twin Peaks’. I have now exhausted my stock of superlatives, so I will salute this yogurt bavarois with condoga (wild strawberries) as simply life-enhancing. The service, orchestrated by Restaurant Manager Mario Esposito and provided to my table by the excellent waiter Francesco, was both professional and friendly. 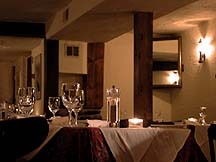 In such a place with such a kitchen, you would expect a magnificent cellar, containing the best the world has to offer. And such there is. At my last count, the number of offerings on the list was 949. Prices range from 45€ for a bottle of prosecco to 12,500€ for the 1995 vintage of the grandest of red burgundies, Romanée-Conti. Other temptations from France include Krug Grande Cuvée for 380€ and 1988 Pétrus for 5,200€. From Italy I noticed 11 vintages of Sassicaia (including 1990 for 1,550€) and 8 of Masseto (including 1997 for 3,000€), as well as that sparkling great, Franciacorta “Annamaria Clementi”, Cà del Bosco, 2004, for 175€. From California there is 2007 Opus One for 750€ and from Spain Vega Sicilia 1994 also for 750€. Sommelier Walter Meccia selected for me a Tuscan red which I had not encountered before. And it was an inspired choice, being exactly the right wine for the divine chateaubriand. This 2011 Piaggia was rich in its dense blackcurrant and voluptuous in its lingering sweetness. Clearly, it has years to go yet, but it was seductively accessible and – with the beef – almost magical in its grandeur. You can certainly trust the palate of Mr Meccia. 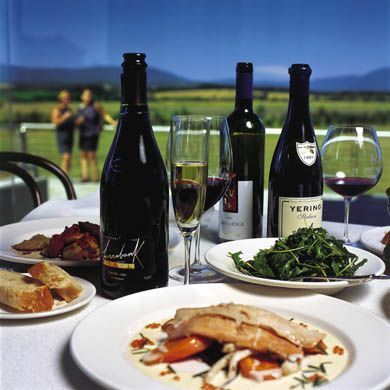 Indeed, you can trust everything at Il Palagio – the food, the wine, the service, the surroundings and, above all, the chef. 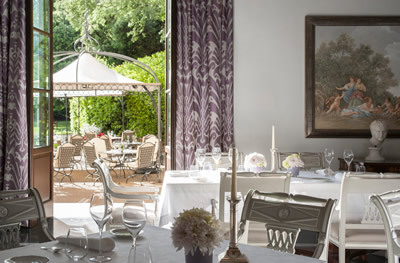 I repeat my opening assertion: this is one of the best restaurants in Italy.